Adults (ages 22+) — A.B.L.E. Creative opportunities for a healthy, happy life. We believe theatre can enhance wellbeing for people of all ages! As they grow older, individuals with developmental differences are more at risk for mental health conditions such as depression and anxiety, and dementia. A.B.L.E. recognizes its responsibility to enhance meaningful creative and social opportunities for this population. Sessions are open to a maximum of 10 actors staffed by 2 teaching artists and 3-5 volunteer facilitators for a 2:1 ratio ensuring each actor gets personal attention and support from our staff. Through the course of a 10-week semester, each actor will discover and hone his/her own personal performance skills, while developing the social skills necessary to contribute constructively to a group. 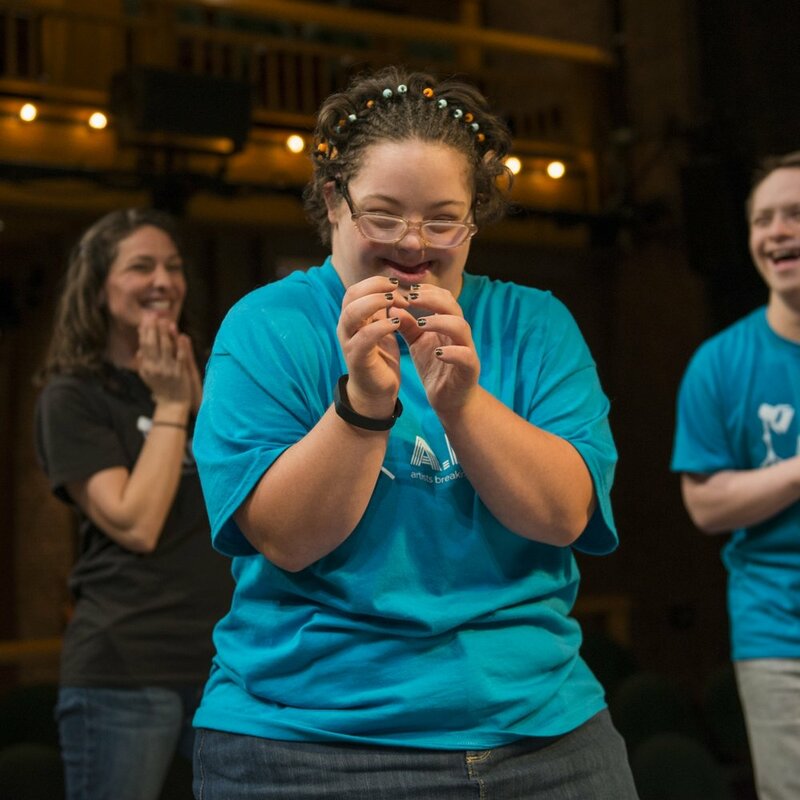 Actors participate side by side with a staff of teaching artists and volunteer facilitators who share their own professional performing experience to create a final project developed by the group. A.B.L.E. offers 2 sessions on Tuesdays - one from 10am -12pm and one from 1pm-3pm. Ensembles run September -December and February-May. Our workshops are a great chance for new actors to see what A.B.L.E. is all about, and for established actors to continue building their skills. As with our teen program, workshops are 2 hours in length and are centered around different theatre skills including Improvisation, Puppetry, Shakespeare, On-Camera Acting, and more. Sessions are offered periodically throughout the year. There are no prerequisites. We partner with other organizations from around Chicago and beyond to introduce ensemble members to new skills and artists. Past guest artists have included dancers from Joffrey Ballet, actors from Chicago Shakespeare Theatre (pictured), and a devising workshop with U.K. company Frantic Assembly. Sessions are offered periodically throughout the year.